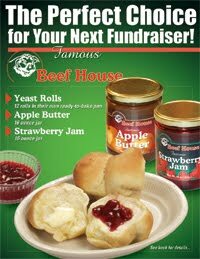 It's time for the Marching Chargers to raise some funds for the band program by selling delicious Beef House rolls, strawberry jam, and apple butter! Band members will be taking orders from Oct. 1 – 21. Please collect payment from customers at the time of order. Checks may be made to Centennial Band Boosters. Payment and orders must be turned in to the band box by Oct 21. Make sure to keep a copy of your order sheet for yourself! The jams and frozen rolls will be delivered on Friday, Nov. 4. Time and place for pick up will be announced later. Rolls will need to be kept frozen, so arrange to deliver them immediately or freeze them. Please get all of your items delivered in plenty of time for Thanksgiving. Remember that 50% of the profits go directly to student accounts. This is a great way to bank for band trip expenses! Any questions? You may contact Jan Briggs at 403-1123 or briggs.smrc@gmail.com.